Now to fit an YM2149 on it and properly amp the audio ! Seems a lot simpler and less work to add a clock divider than an opamp for the same net effect IMO. The 5B is a YM2149F, not an AY. The difference is that YM envelopes can be twice the resolution, and it halves the incoming clock to accomplish this. However, this is not relevant to Gimmick, since it doesn't use the envelope. How do you know this? Couldn't they have put an on die clock divider in front of the AY to accomplish the same effect? I might need a history lesson. But doesn't it make more sense that sunsoft licensed the 8910 from GI, than daisy chain licensing the YM from yamaha who licensed the 8910 from GI? Well, I reproduced the Japanese circuit and used one port of a 74HCU04 as amplifier. Man it surely is LOUD. LOUD is the perfect word to describe how it sounds. Apparently due to the fact that the YM2149 has three current sources instead of one (and I am not even sure if the 5B has the same voltage level output as an YM2149 in each of it's pins) the SSG is way louder than it's supposed to be. But it's fair assume that what the 5B has on pins 2 and 3 is an inverter port. Edit 3 - Circuit makes sound identical as the original cart. 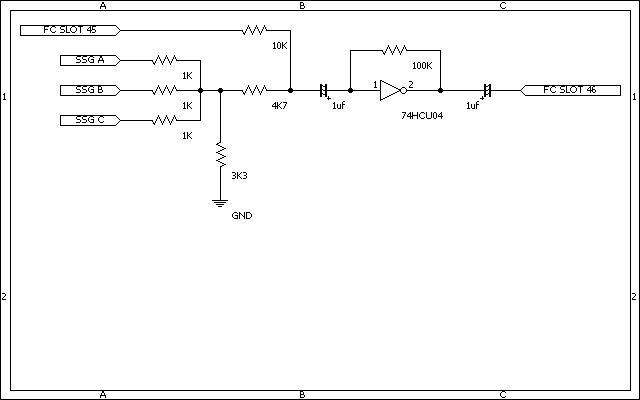 Resitive divider with 3k3/4K7 resistor fixes up signal to an agreeable level. Last edited by l_oliveira on Sat Jul 26, 2014 9:09 am, edited 4 times in total. I would imagine a inverter would be a tremendously loud amplifier since all it knows to output is ~5v or ~0v, nothing inbetween... You might want to consider using something more suitable for audio amplification like the opamp circuit I pointed out earilier. Or a clock divider and the 8910. Considering that the idea is mimic what the real cartridge is doing, it's perfectly fine as is. Rane commented how loud the original Gimmick cartridge is and after seeing this circuit running, I can only agree. I would imagine a inverter would be a tremendously loud amplifier since all it knows to output is ~5v or ~0v, nothing inbetween... You might want to consider using something more suitable for audio amplification like the opamp circuit I pointed out earilier. Using non-hysteretic inverters such as the 74HC04 as an amplifier is a time-honored technique, and already used inside the NES and Famicom's audio path. The amount of gain is a function of the MOSFETs used inside and the resistor closing the feedback loop. Since resistor added, this CMOS gate is not invertor anymore. It's simple, but has it's underwater rocks. You might want to consider using something more suitable for audio amplification like the opamp circuit I pointed out earilier. Or a clock divider and the 8910. One stage transistor amplifier will do the job. YM chip outputs about 0.25V, so we need gain voltage about 10dB. To compare with HC04 vased amplifier you need general silicon transistor and one resistor. Since my goal was mimic the original cart, doing something different than it "ain't any fun"... You get my point, right ? I know this because I counted the steps in the output envelope waveform. There are 32. If it was an AY with a clock divider there would have been only 16. Also, if they were using an AY, I doubt they would have decided to use a clock divider. It would add yet another new component to the design, and there is nothing to gain by doing it. Actually, I would argue that by using the YM2149F's built-in doubler, they've made the chip a lot worse, musically. It adds a useless sub-bass octave to the squares, while taking away most of the envelope's useful high-frequency range. As far as licensing goes, what makes you sure it was licensed at all? Maybe it was just stolen. The two capacitors to the right of the chip are the capacitors added by the schematic, but the third capacitor (the one to the left of the chip) is not. FME-7, Sunsoft 5A and Sunsoft 5B boards (other than Gimmick) do not have electrolytic capacitors on their boards. I would like to add the capacitor, but I can't quite make out the value in the photo. It seems to have a voltage rating of 6.3v, but the capacitance could be .47uF, 4.7uF or 47uF. Can anyone tell me what the correct value is? I am guessing 4.7uF. It's "just" a bypass capacitor for the power rail. (It connects between 5V and ground). 4.7µF should be fine, but the exact value is pretty unimportant. Re: that guide... Is it really easier to find an AY-3-891x than one of the YM parts with the integral clock divider? The AY-3-8912 is a 28-pin chip and the AY-3-8913 is a 24-pin chip and a bit less tricky to fit in some carts than the 40-pin AY-3-8910 or the 40-pin YM2149F. All chips seem to be available for reasonable prices, at least from the less than reliable HK/China sellers. I know there are a few smaller YMZ parts, such as the 18-pin YMZ294 and 16-pin YMZ294, but do they mix their PSG channels in the same way that a Sunsoft 5B chip does? I thought that the pins on a Sunsoft 5B were the output of the individual channels, but two are for a built-in amplifier and the third is the final output. The YMZ284/294 have all three channels already downmixed, but no separate amplifier.